Friday evening, decided to have a little me time, been so tired lately, feeling a bit like Bilbo; “feel … thin. Sort of stretched, like … butter scraped over too much bread” So a sofa and TV felt like as the perfect idea. It’s all I can say. We who thought season 1 & 2 was great, it is nothing, nothing compare to the opening episodes of season 3. If you were thinking that maybe our few survivors would survive, at least a bit into this season, forget it! No one is safe! The writers/producers actually surprised me with some shocking deaths (and I’m not that easily surprised), I did not see that coming. Scenes from the prison are incredibly strong and chocking, there is some interesting twist and turns and more than a few surprises along the way, this is by far the best part of the season. Unfortunately I think that this season’s weakness is the scenes from Woodbury, what a letdown, it simply does not work for me. I wish I could buy and believe, among other things, the growing attraction between the Governor and Andrea, but it just falls flat. Oh well, guess you can’t have it all. Fortunately, Michonne is a more interesting new character that we hopefully will see more of. 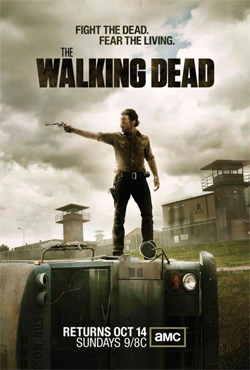 I suppose I just have to wait until the prison encampment and the governor collide, that surely will be interesting. But by far the most interesting development into this season so far is Ricks “fall from grace”, we got a hint of it in season 2 but now it would seem that he is losing more and more of his humanity (or sanity) and while our leader slips, Daryl is sort of stepping up. I really like the development of this redneck character and are looking forward to see what they have in store for him. It will be difficult to wait for the next episodes, and considering the fact that we approaching the midseason and the inevitable Christmas break lurking around the corner (the horror, how will we ever survive!?) there will probably be some nasty surprises coming our way soon. So stay tuned. 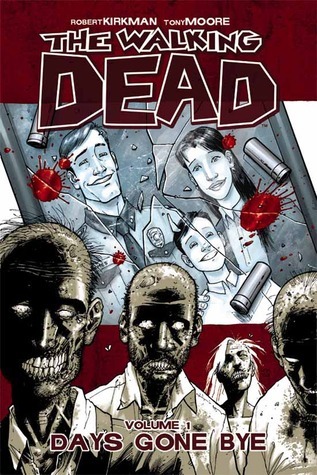 For some reason I been overlooking this graphic novel, so now when the TV-series approaching the third season it’s time to correct my mistake! The world we knew is gone. The world of commerce and frivolous necessity has been replaced by a world of survival and responsibility. An epidemic of apocalyptic proportions has swept the globe causing the dead to rise and feed on the living. In a matter of months society has crumbled, no government, no grocery stores, no mail delivery, no cable TV. This is my first take on Zombies in a more graphic form; I absolutely love the zombie genre ever since my first encounter with the classic Night of the living dead. Most Zombie films are more about gore and quick scares than about character building or questions surrounding the human condition under extreme stress. But in the recent year there been a shift and we see more of the psychological aspects of human behavior. How do we stay alive when the entire world as we know it seizes to exist? This is a story that’s all about the characters and how they cope with their new reality. Tony Moor’s beautiful black and white art is setting the mood right from the beginning. At first it almost feels a bit dreamlike, you follow our hero Ricks awakening at the abandoned hospital, confused and totally clueless about what happened to the world. But that dream fast and brutally changes into a hellish nightmare instead. The zombies are always there in the background during the whole story and when you start to relax there is a sudden burst and someone ends up dead. But the main theme is what happens to a modern society and its people when everything collapses. This story isn’t about gore, guts and cool zombies (well not all of it), it’s about survival, relationships and not all women and men might be good at heart, the may have started that way, but the fight to survive can lead us on to a different path. I do wish that there were a bit more character development, and particularly when it comes to the women. They feel a bit one dimensional and to be honest not so very interesting. But then again maybe the story is all about Rick Grimes…although I personally hope there will be a bit more development of the women and some depth of the other survivors in future volumes. Robert Kirkman just push you, right in to a reality were even the basics in life is a struggle and were friends may become the enemy in a blink of an eye. It is going to be interesting to see how the character reacts to this harsh new world. And when you get to the end of this first volume, it’s sad and chocking and you just want more!